More from Ora: What happened to Brandi Chastain's famous World Cup bra? Sharks and jellyfish and sensory deprivation, oh my! 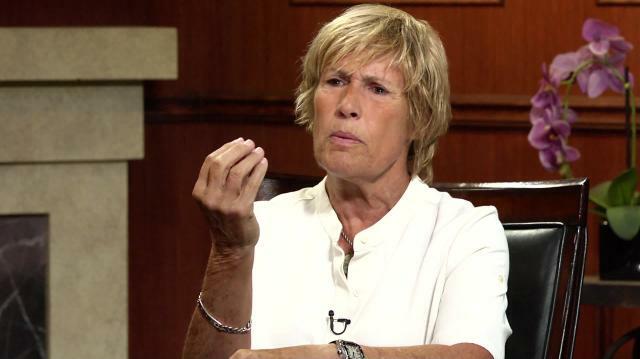 Legendary long-distance swimmer Diana Nyad shares in harrowing detail the frightening reality of swimming from Cuba to Florida – without a shark tank – in the dead of night. Larry King: What is it like to swim all night? Diana Nyad: The nights are tough because the jellyfish are out. You don't know where the sharks are, and they know where you are. You're also in a state of true sensory deprivation. I'm singing Neil Young, I'm seeing the Taj Mahal over here, I've got the yellow brick road. Larry King: What about food? Nourishment? Larry King: You can't chew anything? Diana Nyad: Well, you try. But then the mouth gets- you get peanut butter sandwiches- but then the mouth gets chopped up with all the salt exposure. Larry King: Swimming holding a peanut butter sandwich? Diana Nyad: You tread water for a second, you take it in, and then you swim.